Ever wondered how to publish a document on the Internet? Want to convert any document to an Adobe ® Flash ® (SWF) file or to HTML page or SVG file? Wish to show your document to friends or virtually anyone on the Internet without having them to install special software? Now these questions are readily answered with Print2Flash! Print2Flash lets you easily convert any printable document (e.g. a Microsoft Word or PDF document, a PowerPoint presentation or an Excel spreadsheet) to an Adobe ® Flash ® file (file with SWF extension) or to HTML page or SVG file. This file can be shared with users who don't have the software that created the original document (for example, Microsoft Word). You can view such files with virtually any web browser or Adobe ® Flash ® Player that is available across a number of operating systems. And these files can be easily published on the Web as well for fast and easy access to them from anywhere across the globe. Have a look at the SAMPLE DOCUMENTS converted with Print2Flash! Look at the interactive SCREENSHOTS to learn how to work with Print2Flash! 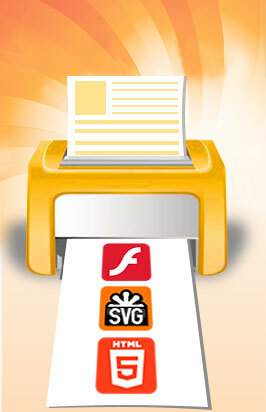 CONVERT and PUBLISH your documents ONLINE using Print2Flash server!